Social media is rapidly becoming an integral part of the Canadian Federal Government’s communication plan. Its use has been institutionalized with the adoption of the Guidelines for External Use of Web 2.0, which provides policy guidelines for government agencies on using social media tools. 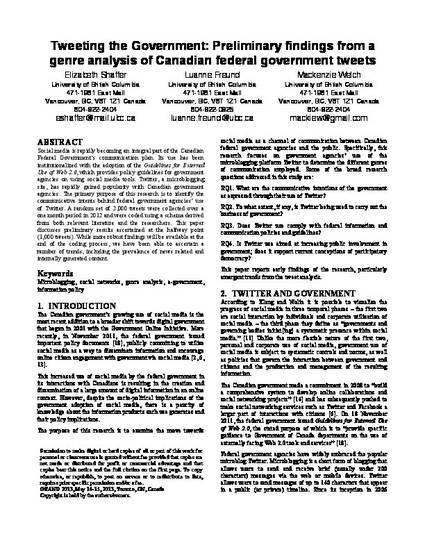 Twitter, a microblogging site, has rapidly gained popularity with Canadian government agencies. The primary purpose of this research is to identify the communicative intents behind federal government agencies’ use of Twitter. A random set of 2,000 tweets were collected over a one month period in 2012 and were coded using a schema derived from both relevant literature and the researchers. This paper discusses preliminary results ascertained at the halfway point (1,000 tweets). While more robust findings will be available at the end of the coding process, we have been able to ascertain a number of trends, including the prevalence of news related and internally generated content.